As earlier detailed, WhatsApp Payments is going to be live in almost all Android based mobile interfaces. WhatsApp Payments is receiving new feature for its Android Beta Users. 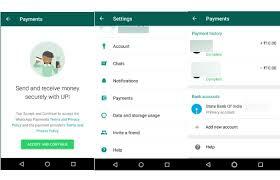 WhatsApp users can request money from contacts, apart from sending money. This is limited to payments initiated by UPI ID and QR code, and doesn't work if you select the contact directly. The new request money feature was spotted in WhatsApp beta for Android v2.18.113, and is reportedly available only for a limited number of users. This facility is in testing mode in India. WhatsApp Payments enabled, they will receive the request in the form of an SMS from another UPI payment app. Post requesting money, the Settings > Payments section will now have a Payment requests section, which shows the status of pending requests. Declined or approved requests will go the Payment history section.